Corporations continue to get blindsided by social media –which of course, is just a representation of underlying customer or product issues that should be fixed. Companies respond in three ways: 1) Ignore it and do nothing at their own peril, 2) Are responsive but not necessarily in control 3) Assert themselves and be proactive –even during a crises. The following three examples highlight companies being proactive in the third effort –and analyzes their end result. Large telecommunications giant AT&T has had a reputation for ineffective coverage and support –an ailment common the bigger companies get. Recently, the iPhone community in both NYC and SF in particular have shouted out against the service and dropped calls they receive (my own company has witnessed this ourselves). As a result, they launched Seth the Blogger Guy, in this video that addresses the conversation head on. Danger: Customers were mounting an online revolt by complaining about AT&T service. Thanks to Gene for the submission. Action: AT&T launched an evangelist program to educate, explain with a personal touch to take on customer complaints. Risks: Critics have blasted this effort, suggesting Seth really isn’t a blogger, and point out that he’s really a member of the PR Agency Fleishman-Hillard. Results: This is still unfolding but I’ll make a call anyways. This is a PR effort designed to quell off a rebellion that we heard and are responding. Despite the good intentions, AT&T will need to fix the customer issues, or this will simply be remembered as lipstick on a pig. Secondly, this is an opportunity for the actual engineers and technicians to become the true stars of the company –give them a platform to speak beyond the PR team. Tech giant Cisco recently made an offer to an intern in silicon valley to work in their San Jose office. This not-so-savvy individual tweeted out “Cisco just offered me a job! Now I have to weigh the utility of a fatty paycheck against the daily commute to San Jose and hating the work.” to her small network not realizing Cisco employees are monitoring the Twittersphere. One replied back “Who is the hiring manager. I’m sure they would love to know that you will hate the work. We here at Cisco are versed in the web.” This spun into a media blitz, including a MSNBC article, and even Oprah calling and requesting both parties join the show. Danger: Even would-be employees can put a brand in danger as the open conversation cascades across the web. This young woman embarrassed herself and the company –yet in reality, her behavior is akin to Generation Y’s vocal ways. Action: Cisco responded in an adult-like way, not trying to draw any more damage to this young woman. Risks: Cisco’s employees who blasted back put the company at risk as ‘picking on her’ need to have an internal crises team to lean on –before responding. Results: For Cisco, this was handled in an ideal way, and a lesson to learnt by all. Of course, the real question needs to be answered: why would this individual hate the work? Video game maker EA sports is not immune to product faults. In fact, a recent Tiger Woods golfing game had a glitch that allowed Tiger to walk on water and hit the ball –in which the YouTube community dubbed the “Jesus Shot” by member Levinator25 which has nearly a million views pointing out the games flaw. Action: EA Sports took the critic headon, and released this ‘response’ video showing Tiger –well, doing his thing. Risks: This was a risky move. Not only does it highlight the games errors, but it risks embarrassing Levinator 25 and igniting futhur rebellion. Results: This was a clever response from EA, but unfortunately, it’s not scalable. With every product likely to have an error, companies cannot afford to have response videos with celebrities. Instead, launch communities that empower customers to submit problems and fixes –outsourcing support and development. The conversation is just starting, submit your own example of a company being blind-sided by social customers and how they responded shifting negative energy into positive. We continue to see that communities will continue to gain more and more power as they lean on each other to make decisions, support each other, and share their lifestyle. What happens to agencies that traditionally serve brands? Seem far fetched? Not really. We’re already starting to see bits of this: I’ve seen user innovation in car forums, Facebook groups, and networks of mommy bloggers. Or take for example UserVoice , GetSatisfaction or Ideastorms that allow communities to define what features they want with products. Imagine for a second that these communities, say bike-enthusiasts, or young mothers, or even home-theater-fans could start to define using organized innovation tools what products and features they want. What if Doc Searls vision for Vendor Relationship Management systems (where consumers define what products they want –brands bid for them) takes off? With communities in the driver seat over product, a shift will happen as communities can define the spec of future products and therefore multiple brands will bid for their business. As a result, we should expect the agency model to flip over, where PR agencies start to represent communities of customers –rather than brands. What if these communities (we’re likely all part of at least one) started to band together and used UserVoice to define what we want? What if a savvy agency saw this, and decided to take our ideas to market on our behalf? What could this wacky idea look like? These PR agencies would take the community defined spec to brands, bid for the top design, and even help negotiate the terms. As a result, they could skim profits off the transaction, or maybe offer new services such as community support, or organize events. Either way, if they stay as the conduit between them. Some users in Twitter mentioned this already happens, that agencies represent communities in non-profits, or at the chamber of commerce, but I’m thinking much broader, into the context of commerce. Perhaps it won’t be that polar, existing agencies that represent brands will adopt the right skills and relationships, and will retain their relationship with brands. If you’ve access, a forward looking report called the Connected Agency discusses how this could work. What do you think of this wild idea? Far-fetched or is it already underway? If communities assert control over what products they want, will agencies follow suit? Update: we’ve now 40 comments below, and without a doubt the wisdom from the commentators is greater than the original assertion. I think one key finding from everyone is that this trend is far greater than PR, and impacts all agencies, and marketing as a whole. Secondly, it’s difficult to determine who these agencies will monetize, and some suggest they’ll go away all together. We’ll keep on exploring this topic, I’ve some new ideas on consumer crowdsourcing that I’ll blog soon. Thanks for being part of the dialog. I really want to hear about the great things your company is doing. In fact, I’ve pretty much dedicated my life to this industry, and you can tell by efforts I’m really listening. It’s important to remember that social media vendors need to walk the talk, and that means demonstrating your social media prowess that you are claiming to sell. I’m all for press releases, they have a specific purpose, but I won’t link in my digests, regular blog posts, twitter and maybe even my reports if you don’t demonstrate how you’re part of the discussion using the very tools you sell. Engage us with a blog post, invite your clients to comment, create a video demo, walk us through the new changes, maybe we’ll embed it, create a community or a wiki to show where customers can go to get support. Extra credit: Bonus points for using your actual product. Vendors, rate your PR firms, are they good? great? PR firms, what has your client done in the past? Can you amp it up for them? PR folks, you have a business opportunity here. Given that recent research shows predicts about 20% in many key areas, here’s an opportunity to help your clients be more successful–and convincing of their releases. Hell, I have to hold myself accountable too, it would be ridiculous for me to stand in front of a client without actually using the tools I cover, so vendors, you can scrutinize me in return. Let’s check each other, and make sure we’re really doing what we say we do. I could have been mean about this and started a ‘walk of shame’ list and egg-faced companies and PR folks, but we’ve seen enough of that, I hope this helps, I’d rather be constructive. 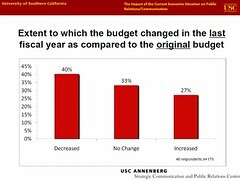 The USC School of Communication contacted me about their latest study based of 200 PR agencies to find out the impacts of their business during a recession. The report and press release have lots of great data and there are dozens of graphs in the presentation, so in the usual web strategy style, I’ll boil down what’s important to business folks –from an industry perspective. The report indicates that “Half (51%) of responding organizations indicated their FY 2009 PR/communication budgets were smaller than what they actually spent in fiscal 2008, by an average of 19%” (reduction rate). This means that half of PR agencies have had a reduction, right about 20%. On the good side, there was some growth “Surprisingly, 18% of the responding organizations indicated that their PR/Communication budgets actually increased from FY 2008 to FY 2009, by an average of 14.2%.” Although the report warns of some caveats in comparing year to year growth. The remainder of respondents (31%) showed no change, although there’s some weighing to the overall economic changes. The report reads that: “For 2009, 56% anticipate compensation freezes, while 21% believe they will have to reduce compensation by an average of 11.7%”. Over one fifth of firms will reduce their compensation, and take about a tenth of their paycheck slices. Now is not the time to buy that new car. Things don’t look so rosy for the PR industry, but they’re not alone, this is impacting just about every other industry. 20% will have headcount reductions and same with compensation. Actually, that number (20%) is what I’m hearing across other industries, it seems to be a common number that I’m hearing from other sales and executives their being impacted with. That’s of course, small data bits, and not anything scientific. The key trend here is that across the board, most firms will trim their workforce, have less money to work with, and most will not be getting raises. Let’s be honest, those in the 20% that are going to get cut are those that aren’t delivering value to clients –or aren’t guiding the company in a strategic way. Let’s focus on the account folks first. Those that are customer facing and are doing the work for brands, need to stay current with their current skill set. If you’ve not developed social media skills by now in 2009, you are behind, and those that already experimented and folded into practice have a couple of notches in their belt, and experience matters second to having a strategy. Secondly, those that are management need to quickly adjust the PR firm to offer more outputs for clients than ever before. Understanding not only how to deliver the traditional PR deliverables of strategy, positioning, influence, and monitoring need to also be aware of the changes that are happening in the digital realm as social adoption increases during a recession, and the growth of mobile devices. Update: See which firms score well on the social front, from ZDnet and Cece Lee’s projects. This one is going to raise hell with PR professionals, but if you’re a buyer of PR agency services, you should renegotiate your fees and contract at a reduced rate. The market simply has changed, and as with every other industry, demand and supply, cause changes. Now, this isn’t to suggest you cut rates and lose the quality of service you’re getting, but figure out what areas the firm is not providing value and reduce those services. On the other hand, you can try to increase your budget with these firms, and ask for services greater than you could have afforded in an upswing, now that you, as the buyer, are in clear control. Update: A marcom director at a large tech company tweeted she already renegotiated her contract with their PR firm, locking them in for a year, at probably a reduced rate, this is both good for the firm and brand as it keeps the cash flowing. Lastly, it’s not as bad as it sounds, it could be worse, you could be in the newspaper business. That’s my take on this helpful report from USC, I’d love to hear your reactions what PR firms, PR professionals, and buyers should do. It’s entertaining to watch how the PR industry self-spins, in this latest dust up regarding a tweet by James Andrews, an executive who works at Ketchum, a well known PR agency. If I interpret your post correctly, these are your comments about Memphis a few hours after arriving in the global headquarters city of one of your key and lucrative clients, and the home of arguably one of the most important entrepreneurs in the history of business, FedEx founder Fred Smith. Many of my peers and I feel this is inappropriate. We do not know the total millions of dollars FedEx Corporation pays Ketchum annually for the valuable and important work your company does for us around the globe. We are confident however, it is enough to expect a greater level of respect and awareness from someone in your position as a vice president at a major global player in your industry. A hazard of social networking is people will read what you write. Not knowing exactly what prompted your comments, I will admit the area around our airport is a bit of an eyesore, not without crime, prostitution, commercial decay, and a few potholes. But there is a major political, community, religious, and business effort underway, that includes FedEx, to transform that area. We’re hopeful that over time, our city will have a better “face” to present to visitors. James, everyone participating in today’s event, including those in the auditorium with you this morning, just received their first paycheck of 2009 containing a 5% pay cut… which we wholeheartedly support because it continued the tradition established by Mr. Smith of doing whatever it takes to protect jobs. Considering that we just entered the second year of a U.S. recession, and we are experiencing significant business loss due to the global economic downturn, many of my peers and I question the expense of paying Ketchum to produce the video open for today’s event; work that could have been achieved by internal, award-winning professionals with decades of experience in television production. Additionally Mr. Andrews, with all due respect, to continue the context of your post; true confession: many of my peers and I don’t see much relevance between your presentation this morning and the work we do in Employee Communications. Apparently, some took offense, and tweeted and an interesting exchange started to happen, as the conversation ensued also on twitter. James then stood by his guns, explained his stance and apologized and helped explain what happened on this own blog (followed by a post by his own wife). Fedex employees need to have some fun with the online conversation, the reaction was a brutal and excessive, but it’s clear that this was a trigger for other axes to grind. Personal opinions must be kept in check when it involves clients and customers. Twitter is often taken out of context, it’s happened to me. Intent isn’t always clear. The PR industry likes to spin it’s own top, and I’m adding to it right now. James Andrews is better off for this, and I admire him for weathering this storm. Rule of thumb: (fitting, if you tweet from a mobile device). When you tweet, you’re publishing, don’t say anything you wouldn’t say to someone’s face, and assume that your current and future boss, wife, and mother are reading it. Thanks to Jennifer Doctor (update: who calls for context of the situation) for spurring me along to comment on this topic. UJpdate: I like Eric’s take on this, and suggests that James didn’t represent himself well as a PR professional, regardless of anyone who should have an opinion. This post is a response to last night’s event at the Horn Group called Is Social Media Killing PR? Sam Whitmore moderated Kara Swisher (media), and Susan Etlinger (PR) and me (analyst) for a lively debate, which resulted in the crowd chiming into the issues. I don’t think the conversation evolved as far enough as I wanted to see it go, so here’s what I wanted to share. For years the Public Relations industry has ironically one of the worst reputations –esp since they are hired to look after the reputations of their own clients. Things only got worse as some brands got punk’d; the introduction of self-publishing tools that allowed anyone to connect to each other using social technologies, causing a shift in power. We’ve already talked to death about the risks and the changes that are happening to this industry, yet I’m hoping to elevate the viewpoint out of the gutter and focus on the larger opportunities –and risks at the industry level. First of all, some things that are already in place need more focus, for example, it was discussed last night that now that influencers (press, media, bloggers, analysts, customers) can directly be reached by clients –PR professionals can be bypassed. In fact, when you look closely, everyone’s doing press, analysis and media. A) Be a filter for clients: There’s a tremendous amount of noise now being created, creating an opportunity for PR folks to filter, sort, and prioritize what matters. You’ll need both access and understanding of brand monitoring tools as well as the ability to see patterns in the noise. B) Council rather than conduit: Although strategic council has been happening for many years, now that clients and influencers can connect directly, this could result in a business shift resulting in more focus on coaching, less on pitching. Mary Trigiani suggests the same. C) Extend Social Strategy: Most firms don’t have a strategic response to social media across the whole firm. While the young digital natives may use these pervasive tools, they lack strategic insight, yet the immigrant executives don’t fully understand how these tools change the communication lines. Two potential customers were at the event, and both lamented that they can’t tell the difference between one firm to another –they all offer similar promises and relationships. The opportunity for PR firms to be more vocal in the areas of expertise they provide are at hand. PR firms should become part of the community they serve –regardless of the client they have on the accounts receivable. Instead, be known as the expert firm in your industry, not just pitching, but also serving and helping beyond your clients needs. There’s a business opportunity here for some smart entrepreneur to create a VRM system that allows clients to recommend PR firms to other brands. I alluded to this yesterday in the panel, but this is perhaps the single largest opportunity for the evolved PR firm. As we know “Public” relations involves prospects and customers, social technologies mush up the lines between when this starts and stops. As a result, PR firms how learn how to offer value to other areas of the organization beyond corporate communications can find new revenue buckets in product marketing, product management, product support, and beyond. I’ll hit this again: it’s very ironic that an industry so focused on keeping the image of their clients reputation pristine is unable to shine their own shingle. Use these social tools to tell your story –and to get your clients to tell your story –on your behalf. Although the HORN group was the only firm to take this challenge head on, the industry as a whole needs to fix this, but it can’t be insular within the PR community, but looking outside the circle of pros. Nov 14th, the next day: There’s really a tremendous amount of different voices, angles and perspectives on Wed’s discussion, read below. Do read the responses from the attendees in twitter (the audience has the control), they tagged it with #prblog. Ravit Lichtenberg Live blog: Is Social Media Killing PR? Live blogging from girls in tech and Horn Group. Kara Swisher was taking video, and posts her thoughts, although she can make execs shake in their boots, she really makes me smile. Find out what the CEO of Yahoo and I have in common. Cece (a marketing stakeholder) said we were taking on baby step topics and missed focusing on how PR should meet the need of marketing –and the business. She’s right. Sam Whitmore the moderator poses some additional questions, I think we’ve all concluded last night’s event really just opened up far more discussions, this is all healthy. Jennifer Leggio was covering this for ZDnet, and has published why PR is not dead, but shows it’s weaknesses. There are photos coming in tagged Horn Group, it’s a thrill to see how all this feedback and media comes in real-time. Charles Cooper from Cnet says that PR is killing PR, and that I focus to heavily on Social Media (which is my primary focus, yet he has a point). Thanks to Chris Kenton for backing me, appreciated, thanks. Adrian Chan publishes an email he had with a PR pro at Edelman discussing what we did and didn’t get.